Did you know the College and Universities that you sent your son and daughter to study to get a real education is haunted? Established in 1900, Lees-McRae College is named after Suzanna Lee and Elizabeth McRae, named by founder Reverend Edgar Tufts after a renowned educator (Lee) and the school’s benefactor (McRae). A friendly ghost, Emily Draughn, is said to be found around Tate Dorm. The site of the dormitory was once Grace Memorial Hospital, which was where Emily died of tuberculosis during the 1930s. Emily made her presence known by making phone calls, operating the elevator, confusing corridors, and shifting furniture. Emily doesn’t appear to have any malicious tendencies. But she exists. Founded in 1848 and with a current student body of only 1200 students, Chowan University is known for its united atmosphere and its athletic record. What the school is also known for, however, is its long history of paranormal disturbances. A ghost haunts the second floor of the Mixion Hall in the Music Hall. Student’s have been reporting to hear music when they get to the room. The piano stops. It was said that someone hanged himself in that room. In Belks Hall, students have heard a little girl giggling while riding her tricycles down the stairs. And screams of someone who committed suicide. The “Brown Lady” is perhaps the most frightening and famous apparition that haunts the school. Lingering on the third floor of the Columns Building, her footsteps have been heard, leading to brief chases by security guards suspecting unauthorized students. Salem College has undergone some transformations since its founding in 1772. Originally built as a primary school, it later was turned into a high school, and then finally a college. It is consistently ranked among the best colleges in the nation and has the distinction of being the United States’s oldest female educational establishment that is still a women’s college. An institution with over two centuries of continued use is bound to have a colorful history, and Salem is no exception. The Gramley Building is the site of a library where two girls were killed in an electrocution accident in 1907. According to reports, the girls visibly manifest and scream at students. Similarly, a student allegedly hanged herself in the attic of Gramley’s dormitory, leading to students hearing dragging and scratching sounds from the attic. A young girl fell down an elevator shaft in Clewell’s dormitory, making many believe her presence is still in the building. The school’s other dormitory, Babcock, is said to have a painting in its lobby of Mary Reynolds (daughter of R.J. Reynolds), whose eyes that follow students as they walk by. Last, but certainly not least, the Fine Arts Center has had a variety of paranormal disturbances, including a phantom pianist who plays pianos and organs, and a patron who died in Theatre #2 and still lingers to this day. Creepy. The story that has floated around WCU for decades involves two female roommates in the 1960s that decided to remain on campus during a school break. Supposedly, one of the girls left the room to take a shower but was gone for a suspiciously long time. When the other girl went to investigate, she stood frozen by the door as a set of scratching noises accompanied a scream from the hallway. Out of seemingly nowhere, a repairman walked by outside the dorm’s window and yelled up that everything was okay, and for the girl to stay in her room. She obliged out of a crippling fear, but as it turns out, the other girl had been raped and murdered. Rumors suggest that the spirit of the murdered girl never left the Moore Building, instead of staying to terrify future classes of girls with screaming and crying bouts. In a strange twist on the regular ghost story, the murderer was arrested and served time in a mental institution, only to die in the mid-1980s. Since then, the sightings of the murdered girl’s ghost have been spotted and believe to be wandering the Hallway. In the 1990s Scott Hall began its conversion to “the dark side.” During this time, it is said that a female student hung herself in the East Wing of the building. Her motives for suicide are not known, but the legend lives on. The floor was closed for many years afterward because numerous people reported having seen the young lady there. Built in 1971, the fifth floor of Harrill Hall has a similar history of unusual occurrences. According to legend, a girl died of an asthma attack while having a sleepover with her boyfriend. Unfortunately, she suffocated in her sleep. Her ghost is now said to haunt the fifth floor of Harrill, along with the building’s elevators. The elevators sometimes open only on the first and fifth floors, but other times they open on all floors when no one is aboard. People on the fifth floor have reported strange occurrences and the feeling of being watched, as well. This girl seems to have influenced numerous parts of Harrill Hall, of which the WCU community should take note. Harrill Hall underwent a major renovation during the 2011-2012 school years. So have you taken a ghost tour of your university? 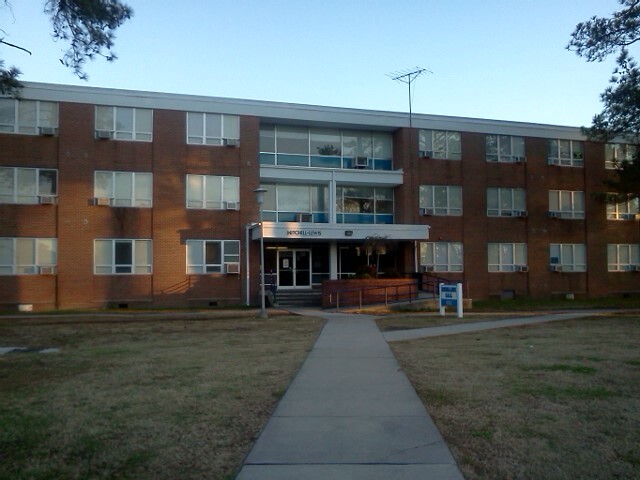 At Elizabeth City State University in Mitchel Lewis Dormitory, a murder happened in 1984. It was Sharon Jones. It was a bloody murder in the spring of 1984. Sharon Jones was found dead with a white belt wrapped around her neck and tied to the frame of the bed. She was naked and face down on the floor. Beaten and strangled to death with a dumbbell that was found next to the body. Her boyfriend did the crime and he went missing. They never did find him and it is a cold case file ever since. Now she haunts the hall of Mitchel Lewis Dormitory. Students can hear her scream in the locked room, or if the room is locked. Is someone staying in her room tonight? Watch out. You might hear her scream in horror or walk outside in the halls of Mitchel Lewis Dormitory. If you want more information about this story, please check your library. When I watch the Oscar on ABC, I am always fascinated by the actors on the screen. How well they portray their character and made their character become one of them, except for Lindsay Lohan – that’s the whole new world for her. I got my first acting bug when I was in the elementary school, and we had to do some skits, during that time, there was no videotape back then, only my memory. The show I watch back then was “Welcome Back Kotter”. In my group, we prepared a skit, someone would say their lines and when it was my turn. I had my chance to say my lines. I did my impression of Arnold Horshack doing “Ooh-ooh-ooooh!” with my hand raised up in the air. It was my first chance to hear laughter in the audience. I was born to make people laugh. In High School, I did a play called “A Wonderful Town”. I did some small parts, and it was good. I had a few lines in the play. I yelled out “Eskimo pies!” I made the band laugh during a rehearsal, there was a cute girl in the band, and I had a crush on her. I ran across the stage stealing a bag. My life in crime on stage, it was only acting, not in real life. And other roles too, it’s vague for me now. I was in Bye, Bye Birdie, for the cast picture I was almost cut off. My head was there, but my body wasn’t. I had few roles in there too. I seem to like the acting. I wanted attention. All of these plays were played in Sheep Auditorium in Elizabeth City, NC. Then I did some college plays at Elizabeth City State University, the university players. The director back then was Shawn Smith. I like working with him. He gave me my first break in acting. I audition for the role of The Good Doctor and I got a role. The scene was ‘The Arrangement’. I played a boy and the father wanted me to grow up to be a man. My line was “When I go up the stair, I would not be your little man no more. I will be a man!” I flex my muscle to indicate that I was a man and use my deep voice to indicate my manly voice when I said the word “Man”. I brought the house down with laughter. The laughter, I like the sound of laughter from the audience. I would reprise the character again for Encore in 2006 when they had the audition for The Good Doctor at Encore. It was many years after the first one. The director like my performance and so did the actor who portrays the father. He’s a veteran in acting and his wife too. I change my line to make it appropriate for the director, and I still got it. I made the audience laugh again. I was born to make people laugh.